Dennis Rivera is a New York based socialist and labor leader. Dennis Rivera was born in Aibonito, Puerto Rico, in 1950. After attending the Colegio Universitario de Cayey, he left school to become a fulltime Union organizer of Puerto Rican hospital workers. When he moved to New York in 1977, he was hired as an organizer by what was then Local 1199, working in several of the city's healthcare facilities, including Montefiore Medical Center in the Bronx. In 1984, Rivera left the Union staff to go back to work as a hospital worker and to become an organizer for Save Our Union, the rank-and-file formation that was elected to replace the former leadership in 1986. On January 29, 2007, Rivera announced that he would not be a candidate for re-election. He will leave 1199SEIU later this spring to lead the formation of a one million member-strong national healthcare workers’ Union within SEIU". When Rivera was elected 1199 President in 1989, the Union had 75,000 members. When he assumed the presidency, the Union was divided internally. Today, "12 other local unions have joined together in 1199SEIU, spawning a dramatic new unity of health care workers into one union that is working to improve healthcare. In 2009, 1199SEIU had 300,000 members working in hospitals, nursing homes, homecare agencies, clinics and pharmacies throughout New York State, Maryland, DC and Massachusetts. In January 2007, Rivera directed the successfully completed collective bargaining with the League of Voluntary Hospitals and Homes on behalf of 125,000 New York metropolitan area members at 87 institutions. The contract includes job security guarantees for every member—including part-time workers---hired before January 1, 2003, and a host of other employment security measures, including a pledge of a job within six months for any member who loses a job as a result of state-mandated hospital closing and downsizing. The contract also secures the health benefits including world-class comprehensive coverage with no out-of-pocket expenses, improves the pension benefits (already among the best in the country) and gives a three percent compounded annual wage through September 2011. Rivera is Co-Chair of the 1199SEIU National Benefit Fund, which provides health care to 450,000 working people in New York, making it the largest self-insured Union healthcare plan in the United States. He is also Co-Chair of the 1199SEIU Pension Fund, with nearly $8 billion in assets, which provides financial security and dignity to retired healthcare workers in New York. Rivera has dramatically increased the political profile of the union, which plays a key role in representing the interests of working people in state and national politics. Over half of the union's members gain a strong voice in the political process by voluntarily contributing $5-10 a month to the union's Dr. Martin Luther King, Jr. Political Action Fund. He oversaw the creation of the Healthcare Education Project, in partnership with the Greater New York Hospital Association, which "has saved nearly $20 billion for New York's healthcare system over the last dozen years. As 1199SEIU President, he helped to pioneer the Child Health Plus and Family Health Plus programs for healthcare coverage for New York's children and working poor". He has held many other important posts in the national and New York labor movements, and has served on the executive boards of the Children's Defense Fund and Riverkeeper, the environmental organization, and the Hispanic Education and Legal Fund. Under his leadership, 1199SEIU has been a leading voice for working families and poor people on a host of social issues-tenants' rights, police abuse, immigrant rights, voting rights, and economic justice. It was the first U.S. labor union to oppose the war in Iraq. An ad/notice was placed in the Guardian, November 8, 1989, concerning an upcoming U.S. Peace Council national conference. 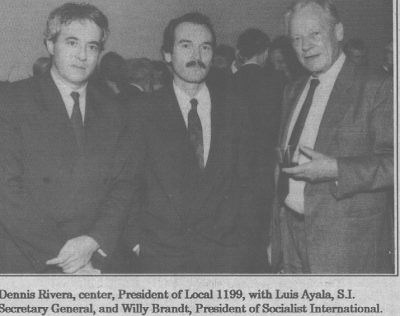 Led by Bogdan Denitch, DSA's permanent representative to the Socialist International, the Democratic Socialists of America delegation to the October 1990 Socialist International meeting in New York, included DSA Honorary Chair, Cornel West, Pat Belcon, a DSA NPC member, Motl Zelmanowicz, a "DSAer active in the Jewish Labor Bund", Jo-Ann Mort, a DSA NPC member, Jack Sheinkman, president of ACTWU, NYC Commissioner of Finance, Carol O'Cleireacain, Terri Burgess, chair of the DSA youth Section, Skip Roberts, Chair of DSA's Socialist International Committee, welcomed the Council to the United States on behalf of Democratic Socialists of America...S.I. General secretary Luis Ayala, introduced Local 1199 President and New York State Democratic Party Vice Chairman, Dennis Rivera, who graciously welcomed the delegates on behalf of his 75,000 member union. S.I. President Willy Brandt responded by thanking the unions for "bringing the delegates back to the movement". On August 31 1991, over 300,000 union workers and their supporters marched in Washington, DC at a second Solidarity Day to say "we told you so." And DSA was there with them. Afterwards. DSA sponsored a well-attended reception at a Washington pub. Dennis Rivera, president of Local 1199 in New York City, and Juan Gonzalez, a leader of the Daily News strike, were but two of the labor luminaries in attendance. In 1991, on the initiative of Local 1199 local president Dennis Rivera, Reps Major Owens, and Jose Serrano and Deputy Mayor Bill Lynch, formed a city wide labor/community coalition Majority Coalition for a New New York, to unite disparate forces for a solution to the city's financial crisis "reflecting the interests of working people"
The coalition aimed to focus on an "issue driven" approach to supporting candidates in Council elections. Empowerment '92: A Call to Action Conference, was held June 6 to 9, 1992. African American community activists, joined with trade unionists, politicians, peace activists, environmentalists and others to discuss how to change the nation's priorities as the economic crisis deepens. Of the upcoming conference DC Statehood Senator Jesse Jackson said..."We issue this Call to Action to reaffirm and reassert our vision of a true world order, one based on peace, justice and human priorities. our message, translated into action can, and must srt a new direction for our nation". 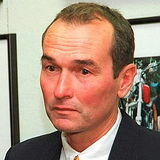 Toney Anaya, former Governor of New Mexico. In her 1992 New York Democratic primary, Nydia Velasquez ran against two other Puerto Ricans Elizabeth Colon and Ruben Franco, president of the Puerto Rican Legal Defense and Education Fund. Velasquez won the primary, receiving endorsements from New York mayor and Democratic Socialists of America member David Dinkins, Rev. Jesse Jackson, Congressmen Jose Serrano and Edolphus Towns, Local 1199 leader Dennis Rivera and Teamsters leader Barry Feinstein and Puerto Rico governor Rafael Hernandez Colon. On June 24, 1993 New York City Democratic Socialists of America held its annual Debs-Thomas-Harrington awards dinner. Local 1199 president Dennis Rivera and DSA member Deborah Meier of the Central Park East Secondary School, received awards.Featured speakers included New York State Comptroller H. Carl McCall, Manhattan Borough President and DSA member Ruth Messinger and DSA honorary chair Cornel West. U.S. Rep. Nydia Velasquez, who was unable to attend because of Congressional commitments, sent greetings. In December 1993 Rev. Jesse Jackson and Local 1199 president Dennis Rivera spent a 5 day holiday in Havana Cuba. the two Rainbow Coalition leaders pledged their support for HR 2229, introduced into Congress by Rep. Charles Rangel, to end the blockade and normalize relations. Jackson was invited by the Cuban Ecumenical Council. The pair met with Cuban leader Fidel Castro, Foreign Minister Roberto Robaina and Finance Minister Jose Luis Rodriguez. In 1996 Dennis Rivera, Health and Human Service Employees was one of the original 130 founders of Campaign for America's Future. Rivera serves as the Vice President of Leadership on the Executive Board of the National Hispanic Christian Leadership Conference as of March 16, 2010. Dennis Rivera, the former president of the union’s giant health care local in New York City was, in 2010, Andy Stern’s top lieutenant on health policy. Dennis Rivera is a past recipient of Asian Americans for Equality's annual Dream of Equality award. This page was last modified on 2 July 2017, at 03:22.